This workshop runs over three consecutive weeks. All the sessions will run at 6pm – 8pm UK Time. 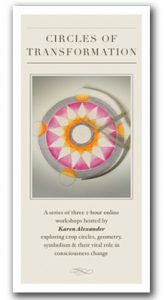 A series of three 2-hour online workshops hosted by Karen Alexander exploring crop circles, geometry, symbolism & most importantly their vital role in consciousness change. Each workshop is filled with gorgeous photography, drawings and first-hand research and we supply a PDF copy of each presentation for note taking and reference. The price for the entire workshop (all three sessions) is just £70.00 – approx $92.00 USD. Booking: You can complete your booking at the top of this page or click on the photo (left) to download a short PDF brochure for the workshop. You can email us to put you on our list for notification of the next dates for the workshop. Note: Our sessions will be small, intimate groups of no more than ten participants per session. They will be live & interactive rather than pre-recorded. Our session format will include beautifully illustrated presentational information, with opportunity for group participation and discussion. No expertise or experience is required, these workshops are for everyone. A series of 3 2-hour online sessions over three weeks.